18+, First Deposit Only. Must opt-in. Min €10 deposit. Max €200 bonus. 30x (deposit & bonus) wagering reqs apply. Wagering on selected Table games only. Bonus valid for 14 days (bonus and winnings removed). Bets covering 67% or more of Roulette rable do not count to wagering reqs. Restrictions and T&Cs apply. The Gala Coral Group has been a household name since 1991, with a large physical presence across the UK in the form of its famous Gala Bingo halls, Coral bookmakers and Gala Casinos. They’ve now pooled all of their experience in order to re-launch the Gala Casino website, combining their gambling know-how with unbeatable software to produce a top live casino experience. Gala were looking to make a real impact with their redesigned Live Casino and, by partnering with cutting edge software provider Playtech, they have achieved just that. The live dealer option at Gala Casino is available to play instantly online using a standard flash player, giving registered users the option to play at a moment’s notice. Gala have also provided a desktop download of their casino, although this appears to be exclusively for Windows users at present. Overall, Gala has built an incredibly user-friendly live dealer area, with slick video graphics welcoming users to each available game. Live tables are quick to load and the resulting video stream is quick and responsive, even with a relatively slow internet connection of 2mbps, making this one of the more reliable sites of this kind around. Users are able to enjoy the real casino experience, with a digital table complementing the live webcam, making it easy to move chips, although cards appear slightly slower on the virtual table than their live counterpart. 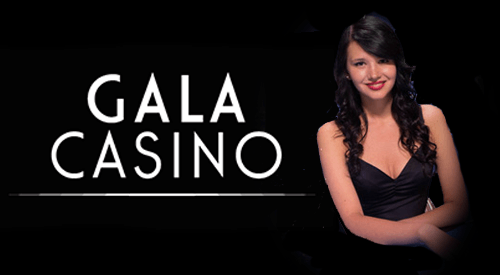 Those looking for an authentic live casino experience will be impressed with Gala Live Casino, with Live Blackjack, Roulette, Baccarat and Texas Hold‘em Poker all available online and on the desktop download. Users are able to pick their table based on min/max bets, number of other players or even by their preferred dealer, with profiles of their dealers available on-site. Refreshingly, Gala employs both male and female live dealers, preferring authenticity over gender bias. Overall, there is a decent variety of games on offer with a truly genuine feel. No online live casino would be complete without the obligatory deluge of promotional offers, and Gala Live Casino doesn’t let the side down. New users can benefit from a generous deposit matching welcome bonus, whilst high-rollers will enjoy a truly spectacular return rate the more they deposit. As well as these site-wide bonuses, users taking part in live dealer games have access to unique cashback bonuses on certain days of the week. Gala also operates a generous multi-tier VIP loyalty program, providing excellent value for frequent players. Gala Live Casino is registered in Gibraltar and has gone to great lengths to ensure the financial security of its members. The site is subject to the Independent Betting Adjudication Service, as well as Playtech’s own rigorous controls, ensuring a high level of overall security. Deposits can be made using the majority of major credit cards, as well as the ever-popular PayPal and UKash platforms for international customers. Customer service can be accessed 24/7, including a toll-free phone line between 7am and 11pm, seven days a week. Overall, Gala has completed an extremely impressive revamp of their live casino offering, combining market-leading software with an experienced approach to gambling. A great site for those seeking an authentic live casino experience.